So, a while back I wrote an article about Office 365‘s security and talked about the connection between Outlook and Office 365 and also between the browser and Outlook Web Access (at http://portal.microsoftonline.com). Both are secure. Outlook uses Outlook Anywhere (an RPC session encapsulated within an SSL HTTPS connection) and Outlook Web Access uses a secure SSL HTTPS session. The question I didn’t answer, however, was what happens to your e-mail when it leaves Office 365. Does it remain encrypted? I’m back now with some answers. TLS is can be enabled on Microsoft Exchange systems and is enabled by default on Office 365. TLS has two settings: opportunistic and forced. Opportunistic checks to see whether the partner in each e-mail conversation also supports TLS and if they do the conversation is encrypted. If TLS is not supported, the conversation fails back to standard unencrypted communications. Opportunistic TLS functions “out of the box” for Office 365 and requires no configuration. If you wish to force encryption between your organization and another you’ll want to look in to forced TLS. This changes the behavior of Office 365 to check each e-mail communication for TLS support and then to deny connections with any systems that do not support TLS. The communication partner can be configured for opportunistic or forced TLS, it doesn’t matter which. This video will introduce you to forced TLS. In Office 365 TLS is configured within Forefront Online Protection for Exchange (or FOPE). It is not necessary to use FOPE for normal Office 365 operation but it gives you (in E1 and higher plans) the ability to perform more advanced configurations. In the diagram, internal applications and devices deliver their e-mail to the relay server with a standard anonymous SMTP connection. 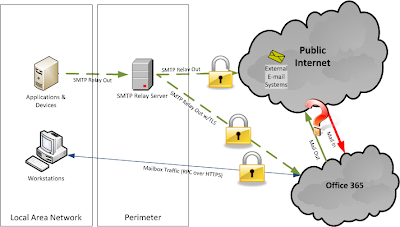 The relay server is configured with a certificate and then creates a TLS connection with Office 365 to deliver the e-mail. It is possible for a SMTP relay server to directly deliver e-mail to the destination server but this bypasses the e-mail hygiene features of Office 365 among other things. Make sure to check Office 365’s restrictions before relaying through the service to make sure that you can do so. In some cases, you may not wish for your e-mail to be limited and won’t care if it is secure or not. Office 365 P1 vs E1 Plans – What Does $2 Buy You?